The price was right: FREE. This 5 gallon bucket occupied a corner of my garage since summer. Long enough! Do I dare paint my living room with a color someone else gave away? Latex mixes with latex. Avoid oils. Interior mixes with interior. Same with exterior. If you don't care about the sheen, mix gloss with flat. Otherwise, mix like with like. Stay within a small range of colors. 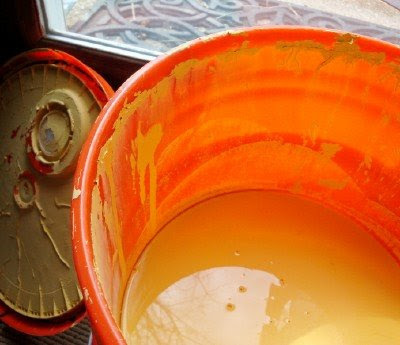 To lighten a base color, pour a cup of dark paint into a gallon of light. To darken, add dark paint cup by cup. The result is hard to reverse. For large-scale jobs, mix in a clean trash can. Decant into empty gallon buckets. Thanks to the Inspired Room for reawakening my love of yellow. 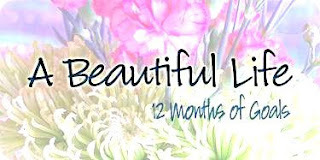 Visit the Beautiful Life series for more ways to reinvent your stuff. When we finished our garage, we used borrowed paint. My sister in law had it left over from painting a rental house. Although it wasn't a beautiful color like that. I say go for it! Left over paint is a treasure- you never know how it's going to be used. Thanks for your tips. Meredith, your blog has delighted and encouraged me for almost a year now. I'm often inspired by your creative projects, done beautifully and frugally. Seeing paint is no exception! I've always wanted to ask though -- how do you do it? I suppose what I mean is, as a mom of two little ones, I often feel like I'm barely accomplishing the minimum to survive - dinner on the table, and clothes all washed. I know that we all make sacrifices somewhere, and that no one does everything perfectly. What would you consider your "sacrifices"? I want you to know I'm asking with the utmost respect; I'm simply curious about the things that you "let go" to make room for decorating projects such as this. Again, thanks for all that you share here -- you bless often! This is a great tip. We did this with leftover paint from our bedroom. The bedroom is a darkish taupe, and we liked the neutral color. When I just couldn't stand the plaid wallpaper in the kitchen we used what we had, our dark taupe paint and white paint, and mixed it together. It worked wonderfully! Thanks for posting the rules for mixing, everyone needs to know them. I painted my entire kitchen walls with a mixture of paint samples and leftovers! I loved it! I can't wait to see it! We have used leftovers from other people or oops paint for nearly our entire house, and I am yet to be disappointed. Love leftover paint. The previous owners of our house left oodles of paint in the basement...I was so excited to see it all when we moved in! What a great idea! Can't wait to see the color on the walls! I was so liberated when I read about mixing paint somewhere a long time ago. This morning dh asked me what color stain did I want on the boy's loft bed..."I have some of this and some of this and I'd really like to use it up" he added. We ended up mixing the stain. Sure we could have spent an extra $25 or $30 (and an extra hour or so trying to figure out what color was "just right") on some new stain - but we decided to use up the old stuff. I'm confused. How can you lighten a base color by adding dark paint? Lightening a dark paint would be when you have, say, a medium blue, and you want it to be light blue. You can't really lighten a dark base color by adding anything to it--the base will swallow a gallon of white paint with barely a change. The better way to lighten that original base color is to START with another, lighter paint (white, or a lighter color of the same shade) and then add the dark color to it, cup by cup. It takes very little dark paint to produce a lightened version of the original dark color. So you're not really lightening the original paint so much as you are using the original paint to produce a lighter version of the same hue. We (and by that I mean my husband) painted our garage using all of the leftover paint we had. Now, everytime I drive into the garage the color reminds me of a Barbie doll's skin. I'm just so glad it's not Barbie's trademark pink. And I'm extremely glad that it was FREE! My dad worked construction for years. He would bring home left over paint all the time. If he did not have enough for a project he would mix things. We ended up with a few odd, I mean, custom, :) colors over the years. But free paint was something he could not pass up. I love free paint as well as oops paint. I have a $1 can of chocolate brown that needs to go somewhere in my house. I have a few ideas, but haven't had time to implement them yet. love to do this. Our dump has a chemical/paint recycling area. As long as I can get my hands on white paint, then I can do pretty much anything. If I get the black, then I can do adapt the colors like you said. I do wonder about when you are mixing 'sheens'. What about when you mix a flat and a glass? i just realized that our 'wood' molding is plastic. I have NO idea why this had not 'stuck' before, but I plan to paint our bedroom thsi summer. Don't leave us hanging....make sure to show us a picture, soon! We've used leftover paint, too - with great results - in our bathroom, kitchen, laundry room and dining room. Thanks for sharing the tips on mixing. Can't wait to see the "after" pictures! I have so much paint in my garage! I was thinking of mixing some since I want to paint my family room. Good idea! Whenever I want to paint something I make a quick stop to Lowes and Home Depot and check out their Oops paints. Of course, for larger projects (like painting the exterior of the house) I go ahead and buy what's on the market...but I wait for good sales and rebates. My Grandma was the first person who I ever heard of doing this. She buys regular white paint and then tints it using acrylic craft paint. I haven't tried this myself, but it sounds interesting, and she swears by it. :) Love that yellow you have! I hit our dump recycling this afternoon. Every can of black and/or white paint they had, two FULL cans of the metallic technique ones...for hammered metal! Several cans of clear gloss AND a partial can of a blue. I'll be adding a bunch of white to it to make sure I get a pale enough color. I've heard (not actually tried) that to alter the shade or tint of a paint you should add a bit of the opposite color on the color wheel. I've never had cause to try that tip yet, though. You sure know how to make-do with class. I have the make-do heart, but not the creativity to support it. I'm watching you, though, and hoping to learn from your gifts! And for other cheap (but not free) paint, look for a Habit for Humanity ReStore.